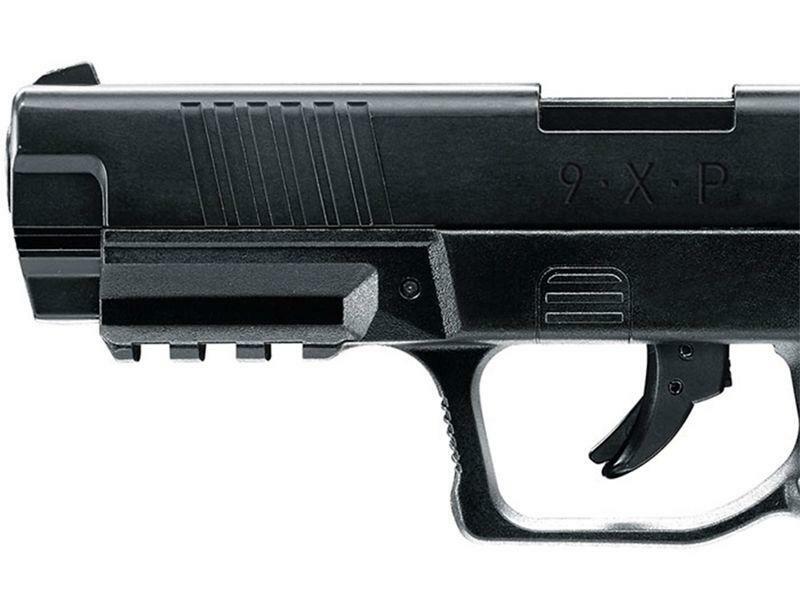 Umarex 9XP Metal Slide CO2 BB Pistol | ReplicaAirguns.ca | Easter Weekend Sale! Trigger Pull: On the medium to heavy side. 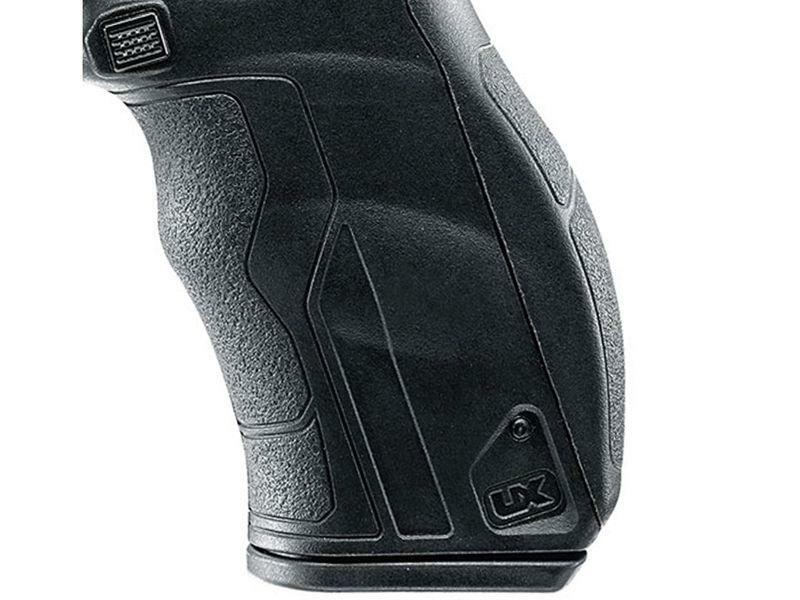 The trigger pull on this gun is a little bit longer and tougher on the 9XP compared to the discontinued Umarex SA177. The gun shoots a little harder though so the internal spring might be slightly heavier. Accuracy: I shot the Umarex 9XP at a target from 30 feet away in a semi-rested position and it performed quite well! I had a nice 5-6 shot group dead center on the target well under a 1 inch diameter and then 4 shots came outside extending the grouping to about 2 inches, again another well centered grouping! Build Quality: It has good weight and craftsmanship. The 9XP shares a lot of the same internal parts as the Umarex SA177 with some minor cosmetic changes to make it look less like a Glock. Realism: The 9XP is essentially a reskin of the SA177, modeled after the popular Glock carry pistol widely used by governmental agencies. It uses blowback action to simulate a real firearm and the metal slide and integrated accessory rail add to the overall realism of this gun. 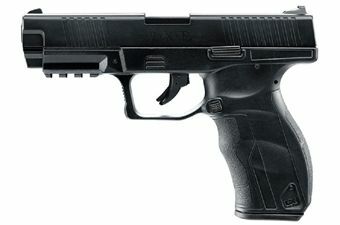 Comments: The Umarex 9XP Blowback CO2 BB Pistol is a nice replacement for the SA177. The trigger on the 9XP is a bit heavier but not by much. During the field test shooting, the 9XP shot at a speed much higher, coming in at an average of 412 fps for my 5 shot string. So if you have been wanting an SA177 but cannot find one used, grab yourself one of the Umarex 9XPs, you will not be disappointed. Okay, so I bought one of these as well as the Glock 17 Gen 3 and this is how they stack-up given the two price points. 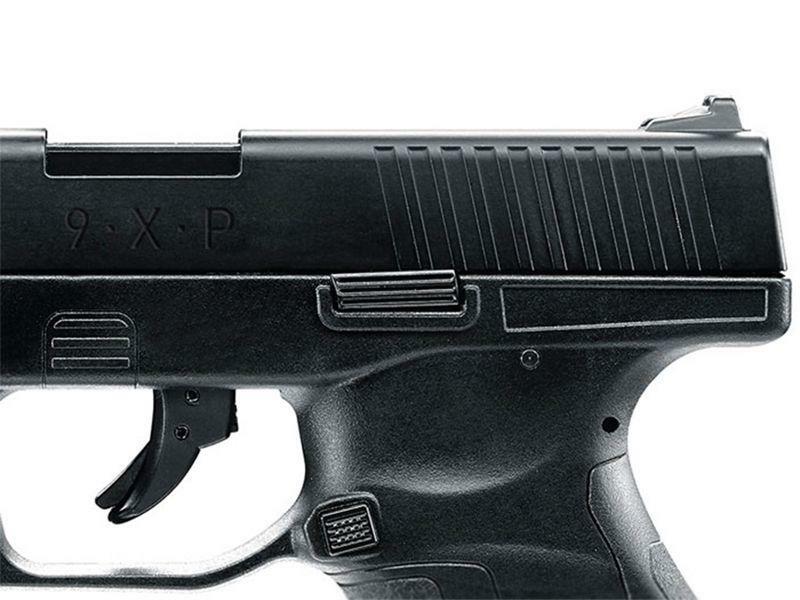 Generally speaking, the 9XP is probably one of the best blow-back guns for the money. You don't have to worry about paying licencing in the purchasing price too which is why it's so inexpensive. I bought one of these for one of my kids. But I am a huge Glock fan so purchased a 17 as well for me, and to my Wife's dismay I pretty much carry it everywhere I go around the house (unloaded of course). 9XP price point is far lower than Glock 17 9XP blow-back is stronger than the Glock 17 9XP BB FPS speed is higher. Accuracy is about the same as far as I can tell at the ranges we shoot 9XP looks are pretty good indeed for a non-replica gun, and complete with the rail mount. 9XP suffers from a slight top heavy feel. Unless you own another 'realistic' replica you may not ever notice this, not quite enough grip weight to offset the metal slide is my theory on that. 9XP and Glock 17 Gen 3 are both partial blow-back guns. You will get higher FPS and better CO2 usage than full blow-back at the expense of the stronger full blow-back feel. 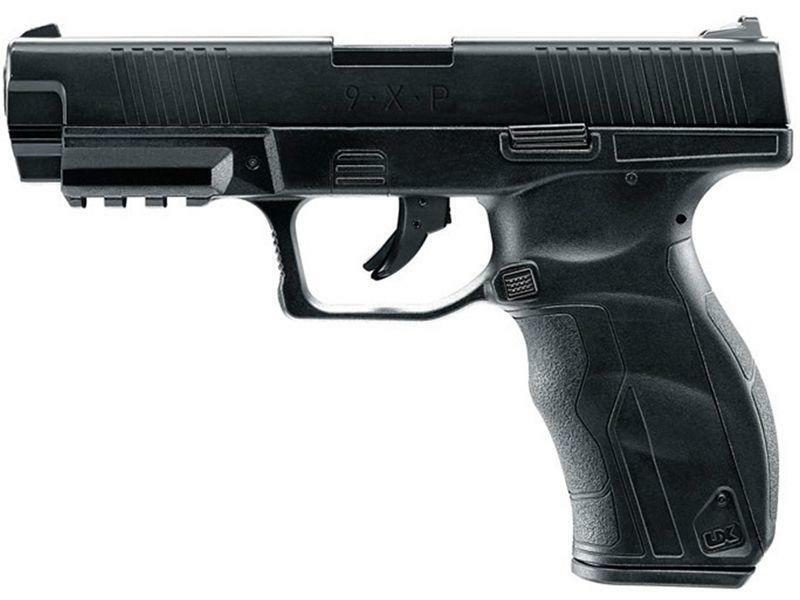 It's unlikely anyone buying a 9XP will be disappointed for the $ invested vs performance, it's a very fun BB pistol. Awesome! realistic blowback, very accurate, very economic on CO2 for a blowback. I recommend it! Nice little pistol for $100. Great for beginners but that's it. The slide wobbles left to right a lot, accuracy is ok and blowback is minimal. I would recommend it to someone who wants to get started in the hobby but not to someone who has another blowback BB pistol. Picked this up as per the recommendations on this site. IMHO, the ergonomics, weight, blow back, metal slide, accuracy, etc. are all top notch. The trigger is a tad heavy and the even though the slide locks back after the last shot, the pistol can still continue to be dry fired. Overall, one of the best options for under $100 CAD. Was my first air gun purchase at this site. After receiving the gun I was very pleased to notice the weight and realistic feel to the gun. For the price of 75$ you can't go wrong. The metal slide is decorative but still a nice feature to the gun. For the price almost no other gun could compare with accuracy, fps, weight and build quality. I watched all of the youtube videos on the site prior to purchase. Other people are complaining about the C02 chamber but i have not noticed any problems to the door hatch having this pistol for 2 weeks. One minor complaint i have is the front sight is not illuminated or white dot. This makes is much harder to aim compared to the SA-177. The Gun is a nice replica and is very impressive. I would recommend this to a friend. This gun works perfectly with Umarex BB's or Crossman Copperhead BB's!!!! This video talks bout the relationship between the Umarex SA177 and the Umarex 9XB, which is basically a replacement for the discontinued Umarex SA177. I talk about the possible reason Umarex stopped production of the SA177 and how the two pistols are both similar in many ways and also different cosmetically. I wanted to not only do my Field Test Shooting review for the Umarex 9XP Blowback CO2 BB Pistol but also compare it to the discontinued Umarex SA177 since both guns share most of their internal parts. I had a good idea that both airguns would perform very similarly with perhaps the newer 9XP having the edge due to it being almost 5 years newer. A with all my current BB Pistol Field Test Shooting Reviews, I test out the real world Feet Per Second performance by shooting 5 rounds through my Chronograph to see what they average out at, of course I use a brand new CO2 for this and my choice of BB was RWS Zinc coated 5.1 grain Steel BB's. I started out testing the Umarex SA177 to use as my baseline and after about 5 warmup shots, the SA177 came back to life after sitting on the shelf for many years un-shot. My 5 shot string averaged a respectable 397 fps which is pretty good for a blowback pistol! I then moved on to the newer Umarex 9XP CO2 Blowback Pistol and right away it popped out all 5 shots at over 400 fps with an average of 412 for my 5 shot string. Not only was the Umarex 9XP more powerful but it also had a snappier blowback action and was louder than the SA177 leading me to believe the CO2 valve may be setup to let out a bit more CO2 with each shot.